The winner of the South West Club of the Year 2015 is the 2013 National CAMRA Club of the Year, the Cheltenham Motor Club. The CMC has won the South West award for nine of the last ten years, which is a testament to the high standard achieved and maintained against strong competition across the region. In late breaking news it has been announced that the club is a CAMRA Super Round winner and will now go forward as one of the four finalists for the title of CAMRA National Club of the Year. 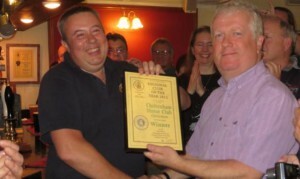 CAMRA Regional Director Gareth MacDonald presented the South West award to Club Steward, Neil Way. Among those present were CAMRA Chief Executive Tim Page, club members and CAMRA branch representatives attending the October South West Regional Meeting. Cheltenham CAMRA Press Officer, Tony Lucas, said: “Gloucestershire and the South West enjoy a great reputation for both the quality of the beer brewed here and the high standard of our pubs. Bristol in particular is a major destination for real ale fans. So for Cheltenham to collect both pub and club awards for the South West, and for both of them to reach the final four shortlist for UK Pub and Club of the Year” really puts the town on the map. “The beer scene continues to develop here; the first Cheltenham CAMRA Real Ale Festival at the Town Hall attracted over 2,500 people. Somerset craft brewer Wild Beer recently opened an exciting new pub/restaurant in Cambray Place and several other new pub/restaurants are due to open in town.